So after hearing about it and thinking about it, it seems to make sense for me. It was either makeshift a standing desk and enjoy the various health benefits (e.g. burn more calories) or spend more money needlessly to get a hopefully more comfortable (ableit rather expensive) chair without much guarantee that it would give me the support I need. Mostly, DIY examples I saw utilized boxes and books to make it happen. And it just so happens that I do have a decent amount of books to make this happy (go figure, me, books? NEVER!). I stacked the books and started it out at my home desk. The results have been overwhelmingly well but there are some adjustments that need to happen. What I noticed first was I was (as some have mentioned) feeling more engaged or energized in my thinking. This is akin to the studies that say talking on the phone while standing up instead of sitting down, produces a more controlled flow. 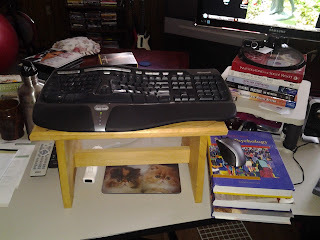 However, I also recognize that this could be psychosomatic influence as well as just more aware of my new environment after years of desk sitting. A slight drawback (but really a benefit of productivity) is that my darling cats (Pumpkin and Bear) are less able to distract me by cuddling up on my lap and fiercely demanding attentioning (through purring, nuzzling, and being cuter than Puss'n'boots). This just means that I'm more productive overall and can then give them more direct attentiopn--I'll take it. and added the books and footstool. There are two elements that concern me. One is a structural feature that needs tweaking. The other, I will just have to monitor. The first is that I haven't managed to get my monitor high enough and am so looking downward more than I should for the neck alignment. Clearly, I'll need to find more books (who knows where, right?). The second is that while I'm chockful of energy, I'm not feeling...well...seated. That is, I'm on the edge of doing things, but have trouble feeling like I can settle in on something. This is a fascinateing side effect thus far and always reminds me of how body and mind work together. Settling into something and sitting down. The implication is that I'm in it for "the long haul" and yet, my mind at least initially is having trouble making this jump. But overall, I'm really liking it. So after the first few days, I followed suit with situating it at my desk on work. Again, I found the experience well. Interestingly, there are occasional days when I am lagging at work. If I'm sitting, I'm not only yawning but fighting to keep my eyelids open. This is usually not because of the nature of the job, but because my body isn't getting the rest it may need or just not moving around enough. However, by standing the whole day this became much less likely. I don't recall it happening once and though I assume it is still likely to happen in the future, I believe that it will happen less. The reason is that key parts of my body aren't at rest because I'm standing. The sleepiness will often take its cure from a resting body. So I went in strong, a full week of standing most of the day after much sitting over the last 6 months. Clearly, my body felt it. I experienced soreness by day three at work. I went in strong, my body was not so happy about it, but soreness isn't a bad thing. It's your muscles being re-awoken. To be clear, I did not stand for 8 hours straight. During my lunch break, I sat. If I was at a meeting, I usually sat. And other situations where custom was sitting I sat. But I was still standing an average of 6-7 hours a day at work (nevermind how much I stood at home or in teaching class). I will continue to use this, short of any serious concern or obstacle. However, one recommendation for others who would move forward with this direction. More than anything else, I find myself stretching more. Standing is nice, but it can be just as obnoxious in some ways as sitting. I try to make sure that at least once an hour, I stretch. My back, my feet, my calves, quads, and hamstrings. They need some relief and loosening. I'm glad with the results. My body feels more energize and so does my work. Anyone else out there that has tried this or considered it? Experiences (good and bad)? 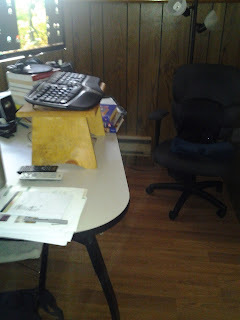 My new desk will have the ability to raise and lower. Also my current chair is a large sized Herman Miller Aeron. I can't wait to get my desk though. even sitting, I need it up about 2 more inches. Well, you know my story about my back. I will have to accommodate its needs for the rest of my life. Ever since my back has conversed with me in this way, I have had to change my life in ways I never really thought about before. A combination of standing, sitting,lying down, and walking throughout the day has now become my new normal. I wonder if standing for 6-7 hours is just as harmful to your body as sitting for the same amount of time? Like you stated, if posture is not correct you could do some damage to your body much like incorrect posture while sitting would do. Well, I think it is over all better for our bodies than sitting. Seats as they're currently composed don't really fit our evolutionary development. I don't think standing straight for 6-7 hours is ideal either, but the likelihood of me to move around while standing (even stretch, and yes, ahem, dance) is much more than when I'm planted in a seat. It's easy to be fidgety but not actually get up and move.